So many people fight for the survival of their church at all costs. I’m sure most mean well, but what’s wrong with killing the church to save the church? I should probably explain…as many will undoubtedly voice concern about why we should save the church. But what many churches are doing is killing the church as we once knew it and refocusing on areas of church health. You likely have seen many examples of this in the business world, on professional sports teams, and and also in the governmental sphere. If it can happen in those contexts, it can also happen in the church (and it should in many contexts!). If we are honest, we would probably all admit that it should happen in our own lives in some area that needs improvement. Nobody is perfect. Nobody is “there” yet. Your church has areas that you or someone else needs to address. Has your church experienced exponential growth over the past year, but your systems didn’t keep pace with your attendance? Has your focus shifted towards attendance and giving only, rather than Jesus’ command to go and make disciples? We have found that healthy churches are unwilling to accept what is unhealthy. They make changes even when it isn’t popular, because it is the right thing to do. 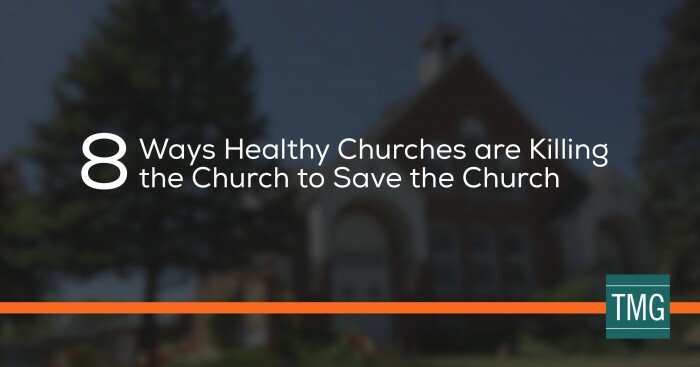 Most of them are engaged in one or more of these 8 ways healthy churches are killing the church to save the church. You’ll never make progress towards getting rid of unhealthy patterns in your church without taking time away. When is the last time that the pastor, church leaders, elders, deacons, council, presbytery, or other group from your church got away to assess how things are going? We’ve found that healthy churches have leaders that establish healthy rhythms of assessment, rest, and dreaming. Make sure your leaders don’t only get together to “do the business” of the church without ever enjoying time together, looking at things with a critical eye, and also dreaming about where God is leading you. You might find that you and others come alive when you have a large dry erase board, lots of markers, and some mountains, a lake, or something else nearby for inspiration. When is the last time that you asked, “What are we all about?” Busy is par for the course these days as pastors and other leaders lack time to get the mundane tasks done, much less go back to the basics. But if your basics or fundamentals are lacking, you may find that many other things are as well. You can’t “be” about everything. Realizing this usually means that you have to let go of something good, in order to embrace something better. What do you need to let go of? What are you all about? Do you have alignment throughout your church on these things? In many churches, not only is the church lacking alignment, but the leaders themselves are also far from being on the same page. Do you know what you intend to accomplish in the next 90 days? What about in the year ahead? If so, well done. If not, what would happen if you did? The exhausting approach of attempting to do everything everyone wants and provide everything to everyone will exhaust you and your church. People need to have focus. They need leadership to help them narrow down and focus on what must happen versus what could happen. People need help taking the bold steps towards killing the church to save the church. What is your one thing that must happen? When you know your one thing, you may not know all that has to happen to get you there. In many churches, if people were really honest, the true “one thing” is making sure weekend services happen. But do you really want that to be your one thing? Do you really want to spend all your time focusing on weekend services? If you are spending all your time and energy on the weekend services, what are you accomplishing through your weekend service or services? We recently came alongside of a fast-growing church looking to improve their operational roadmap, scale for continued growth, and streamline their approach. One of the things they realized right off the bat was that they were spending the majority of their time and resources on the weekend services — leaving them with little left for what truly mattered. The pastors, presbytery, and other leaders voiced a value of discipleship that didn’t align with the reality…discipleship wasn’t occurring. So what do you think we did? We immediately worked with the staff to design a discipleship process for the church members, right? Wrong. We took time to invest in the discipleship of the lead pastor and staff. Yes, you read that right. We realized that the pastor and other staff members needed discipleship in their own lives prior to addressing the discipleship of the congregation at large or even the leaders. The staff are now intentionally cultivating disciple-making relationships with the presbytery and other lay leaders, as they work on a multi-year operational roadmap that prioritizes healthy and innovative discipleship. Does that describe your church? Why or why not? The reality of disciple-making is that it will never happen over night. It also is highly unlikely if you aren’t committed to cultivating disciple-making relationships among the staff and other servant leaders in the church. Measures aren’t important due to the value some people place on numbers and measuring everything. They are important, because they reflect what matters to you. They are important, because they represent people. Then, as you reflect on them, you begin to see how you are doing and what needs to change. A simple case in point would be discipleship. If your church is committed to making, maturing, and multiplying disciples, it is only natural that you would measure your progress in the area of discipleship. You may find that in a few of those areas things are going well, but you are not creating processes that allow you multiply disciples in an innovative way. This can provide powerful direction as to what needs to be addressed in your church. Where is your church heading? I’ve worked with at least three churches in the last 12 months that overemphasized their new building to the point that it seemed like their church’s vision of the future was to worship together in that new building and never leave. That’s an exaggeration, in order to make the point that your building, your activities, and your weekend services aren’t the vision of your church (at least they shouldn’t be). If you have allowed yourself to communicate vision in a way that points to those items as the embodiment of the vision, you need to isolate those areas and kill that part of your communication; this will open a new door for communicating about the future. If you were to do all those things and God “blessed the socks off” your ministry, how would the people live differently? How would your church have impacted your city? What noticeable changes would have occurred in the neighborhoods surrounding your church’s building? Create a picture of what the future looks like. Stop and paint that picture with words that describe (in exciting detail) how different the future will be because of what has occurred in your church. Don’t attempt to do everything for everyone. Isolate what distinguishes your church in a unique way from other churches. If you can’t state in a simple way what unique value your church brings to your community, you likely have gotten so immersed in activities that you’ve forgotten what you and your church are all about and what makes you unique. I’ll never forget the first time I heard the word “iterative”. Iterative is an adjective that describes a process of repeatedly doing something over and over. That’s how I view strategy, operations, and systems. You have to come back to them over and over to make sure that things are running smoothly. You also have to not only look at them, but make changes to them if you want to see noticeable results. Let’s do away with the idea of annual work plans and 2, 3, 4, or 5 year strategic plans that address the operational realities of what must happen between here and now. What if your church were to commit to a 90-day period where you return to your operational roadmap at least every 90-days for a brief period of time to assess what is working and what isn’t? What if you evaluated your own spiritual health and growth every 90-days? The notion of killing the church as it has manifested itself for years should also include creating reproducible patterns that people can multiply. If the only people in your church who know how to disciple anyone are staff members, you have already killed your church. I would also question the effectiveness and biblical rooting of your discipleship as well. But why is it that in so many contexts we assume that only staff members and/or those with seminary training can “do ministry”? As a collective body of Christ, the Church (capital C intended) has over professionalized ministry. We’ve created an enormous chasm between the pulpit and the pew. We’ve supplanted a culture of multiplication and transformation with a culture of information and preservation. And at what cost? My goal isn’t to criticize anyone or frustrate you as you faithfully serve our Lord. I actually applaud all the pastors who invest countless hours in serving their people and proclaiming the truths of Scripture. But at some point, in order to see our impact multiply, we have to stop focusing on what preserves the past, in order to innovate what will multiply fruit for the future. We have to get past our own insecurities that have kept us from entrusting responsibility to others and letting them lead. We have to begin controlling the church less and unleashing its potential on the world more. We have to cultivate disciple-making movements, in lieu of attendance-driven spectacles. We have to affirm the imago dei in others by stepping aside, so that they can deploy and multiply their gifts. Make sure you have a leadership pipeline that fosters this sense of empowerment and affirmation for leadership. We have to kill what makes us comfortable, in order to invest in what makes God known and changes lives. We have to begin killing the church to save the church. If we do, we will eliminate the church as many have known it, in order to see its expression on earth in ways that have yet to be seen.